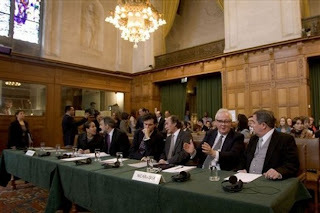 Sir Ian Brownlie, the second from the right on the photo, taken at the International Court of Justice when he was arguing the Nicaragua-Honduras case for Nicaragua. The great British international lawyer, Sir Ian Brownlie, died on January 3th 2010, in a car­-accident while on holiday with his family in Egypt. His name is a household word for international law students. Sir Ian Brownlie was international Chichele Professor of Public International Law (after 1999 as Emeritus) at the University of Oxford and a Fellow of the All Souls College. He was a practicing barrister since the mid 1960s and appeared in several courts, international and national, including the House of Lords, as well before numerous international tribunals, the International Court of Justice (ICJ) in The Hague, the European Court of Human Rights and the European Court of Justice. Highlights of his career included advising US President Jimmy Carter during the Iranian Hostage Crisis as well as appearing in a series of high profile cases, including the 2006 Bosnian genocide trial, which was heard the by the UN’s top judicial body the International Court of Justice. He also represented Amnesty International at the extradition trial of Chilean coup-leader Augusto Pinochet in 1999. According to the Guardian, Sir Ian Brownlie was a strong believer in the bar's "cab-rank" principle, and frequently acted for ­unfashionable clients and causes, enhancing his ­formidable reputation for integrity and independence. Brownlie also had his own style of advocacy. His approach was understated and focused on substance, and he was not interested in "hand-waving or flamboyance". He had a knack of quickly getting to the heart of a case and the key issues. In his politics he was a progressive man, and he was often perceived as being on the left. Brownlie was much appreciated by the judges at the ICJ and was treated with the greatest respect, as a major figure who made a unique contribution to the progressive development of international law. Over the years he helped shape public international law through numerous notable publications and practical achievements. His first book, International Law and the Use of Force by States (1963), identified the United Nations Charter as a significant new moment for the rules governing military force. Most famous among his publications is perhaps his manual on public international law, ‘Principles of Public International Law’, which first came out in 1966 and was published in its 7th edition in 2008, and which – rightly – has been called ‘the most well established and authoritative textbook on international law on the market' (See for the latest book review on studentlawjournal). Now in its seventh edition, and one of the most read treatises on the subject, it has been translated into Russian, Japanese, Portuguese, Chinese and Korean. Almost every international lawyer and judge has referred to this classic text. Brownlie's other collection of writings touched on a range of varied topics, including international human rights law, African boundaries, the law of state responsibility, human rights and the rule of law. "La muerte de Sir Ian Brownlie: el mundo del derecho internacional publico en duelo".